I love reading new books to my kids. We read every night before they go to bed and my daughter has picked up reading as well. She loves reading in her spare time and together. 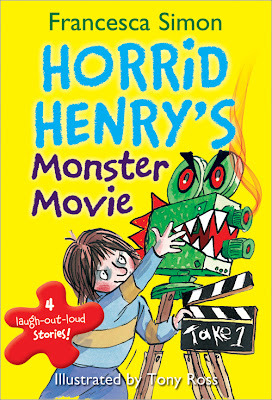 We had an opportunity to read a book from the Horrid Henry series and since Halloween was around the corner I found the book, Horrid Henry's Monster Movie quite fitting. While reading the book, Horrid Henry's Monster Movie to my kids the story itself was very entertaining. Not only were my kids intrigued and wanting to me to read more and more of the book, but I found myself curious and entertained from the main character, Henry. This book is perfect for kids of all ages and is just in time as the end of the spookiness for Halloween is coming to an end. Not only was there one story in this book, but there are four total that are filled with exciting new adventures and situations that Henry gets himself into. All that are exciting and worth the read. Your little ones will love it and you'll be entertained as well! Disclosure: All opinions are my own. I received Horrid Henry's Monster Movie at no cost for the purpose of this review. No other compensation was received. Thanks to the PR company for the giveaway prize!